Trash and recycling containers will keep trash isolated so it does not contaminate or cause odors in any part of your facility. Recycling containers will keep your facility organized and remind employees the importance of recycling for the environment. Knockout series waste receptacle enhances style with upscale inserts. 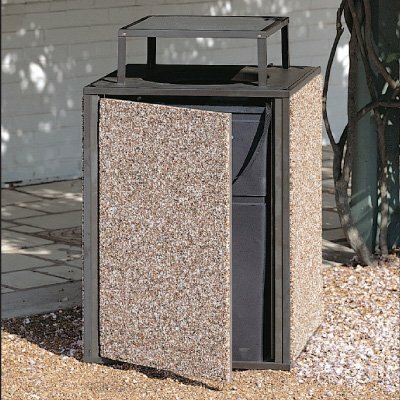 Trash Cans & Ash Receptacles can help keep your property, grounds or facility tidy and free of trash. The addition of Trash Cans and Ash receptacles to your grounds tells your workers that if they smoke, eat or dispose of trash, there are proper places to place those items...And it is NOT the ground! Seton offers a variety of cans and ash receptacles, including Smokers Cease-Fire Receptacle- Table Top Accessory, Brute® Round Containers - 44 Gallon, Aladdin Smokers' Stations, Sentinel Bins, Cigarette Disposal Bin and much more.